Simple, hilarious and gorgeously illustrated, I Just Ate My Friend is a fun picture book about a monster’s search for a new friend after he eats his first one. As our yellow-speckled monster tries to find someone to like him, he soon discovers the other monsters are a little picky when it comes to friends. Each one comes up with an excuse as to why they can't be chums, and our poor yellow monster gets sad. Regretting his snacking blunder and wondering if he’ll ever find a new pal, he meets a green-speckled monster and a friendship is struck. Until… well, I won’t spoil the ending. You’ll have to buy the book to find out. With a visually stunning night-time landscape, the critters and creatures that inhabit this story are both cool and cute. Vibrant greens, reds and yellows stand out against the pitch-black background, and the contrast is kind of irresistible. I found myself enthralled, and my daughter insisted on taking the book to bed with her. Funny and fun, this is a book that will have you and the kids sharing a laugh. But there are also some masterfully camouflaged messages in this story about relationships and the challenges of the ever-changing rules of schoolyard friendship. The story shows kids what it might feel like when someone doesn’t want to be your friend, and it features important emotions like worry, sadness and happiness. With a strong visual focus on the monsters in the book and lots of awesome close-ups, it’s very easy for kids to identify these important emotions in the monsters’ expressions, making this book a very clever tool for discussing feelings and the foibles of friendships. This is a fresh and original story from a talented Australian author/illustrator. 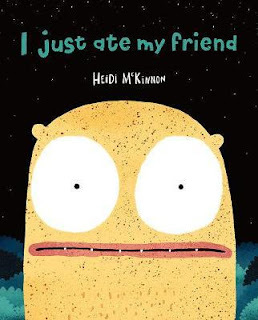 It’s Heidi McKinnon’s first book, and I’m already looking forward to her next one.